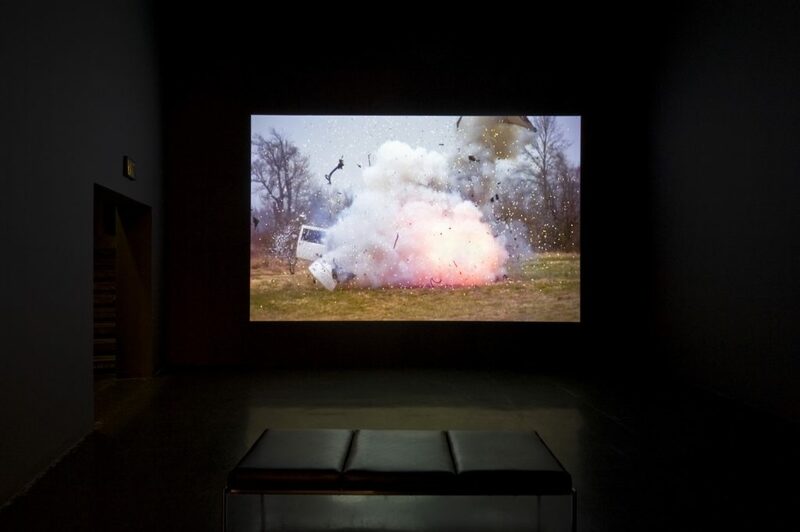 Will Rogan’s video Eraser (2014) shows a hearse parked in a clearing amidst leaf barren trees. The steely grey sky stands in stark contrast to the vehicle’s luminously pristine white finish and makes this already deathly object seem even more ghostly. The grass underneath is half-turned brown and further marks this as a lifeless landscape. Suddenly, however, a flash begins to emerge from the front tire, illuminating the ground with a fiery glow. As it begins to radiate, the flash slowly spreads across the hood and the windows until the car begins to buckle, smoke creeping up in columns across the sky. As the door juts off the body, we begin to realize that we’re witnessing an explosion in slow motion, total destruction rendered almost balletic through a poetic stretching of time. Shot with a technically advanced camera that shoots 6,900 frames per second, Eraser expands four seconds of “real” time into a nearly six minute duration in which we witness a slow but absolute annihilation. By slowing down the video’s pace to a near crawl, Rogan’s work could be seen as a deliberate resistance to mortality, as if he could actually forestall or delay death in defying the rules of time. At the same time, he employs a wry visual humor that relishes in absurdity in which the exploding hearse becomes an over-the-top funeral pyre and a clear example of “overkill.” In gesturing towards a darkly comic ars moriendi, Eraser fits alongside other humorous narratives about death such as the 1971 Hal Ashby film Harold and Maude, which also ends with a scene of a similarly demolished hearse. But just as that film ends with the promise of hopeful next chapters, Rogan’s video also offers the strange but meditative possibility of regenerative beginnings. Screened on a continuous loop, Rogan signals that it is impossible to escape reminders of our mortality, and just as the explosion finishes, the hearse appears again, seemingly untouched. But if death is ultimately inescapable, Rogan also reveals the beauty in clearing away its reminders and beginning again out of fire and smoke. Based in the San Francisco Bay Area, Will Rogan’s practice reflects the poignant, the ironic, the disastrous, and the beautiful in his surrounding urban and domestic landscapes. In the form of photography, video, and sculpture, his interventions often highlight the profound and analytical in everyday life. Taking a playful stance on mundane situations and structures, Rogan’s work merges the critical with the poetic. He is also the co-editor and founder of the quarterly journal of editions, The Thing.